A visitor to our site recently asked us about using our formatted quotes for a Powerpoint presentation he was preparing. We invite you to copy formatted quotes from our site for speeches, presentations, or even to tape quotes to your cubicle wall, bookcase, refrigerator, whiteboard, clipboard, notebook or bathroom mirror for personal use. 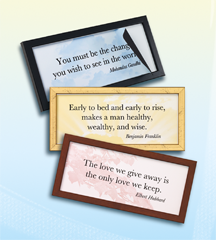 Framed quotes are perfect for certain settings and gifts, but that shouldn't stop you from displaying our quotes in other settings, when an electronic copy or small clipping will do. We make it easy for you to find the perfect quotes for any occasion, and would love to hear that you are using our designs personally in creative ways. Here are 11 great success quotes, formatted and attached as jpg files. To use these quotes, simply right-click (or CTRL-click on Mac), and choose Save As.. to copy them to your computer. Visit us at QuotePalettes.com to find hundreds of other quotes for your next speech, presentation, personal letters or greeting cards. Let us know what you think of these quotes, and if you use these or others from our collection. Thanks! In the realm of ideas, everything depends on enthusiasm; in the real world, all rests on perseverance.